CCHS is accepting applications for the master’s degree in population health sciences program. 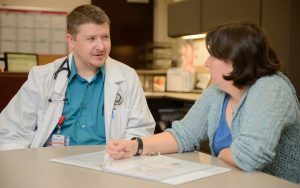 TUSCALOOSA, Ala. — The University of Alabama’s College of Community Health Sciences will offer a new degree program designed to bridge the gap between research and clinical practice beginning in the fall. The Master of Science in population health sciences degree will address the changing landscape of health care by observing health outcomes and patterns of health determinants, as well as the policies and interventions that link them both. The leadership at CCHS and University Medical Center, which is operated by the College, recognizes that intellectual investments in the future of health are necessary to provide a high quality of life for communities. With that, the degree curriculum will integrate clinical care and public health practices to prevent, reduce and manage human disease, primarily through the use of patient-centered approaches to understanding the needs of a diverse clientele and by incorporating a value-based healthcare system. By expanding training within population health practices, the College seeks to advance the means by which health care is accessed, provided and utilized. Providers will be able to move away from dependence upon primarily reactive responses to an individual’s health needs and work toward achieving outcomes-based, proactive approaches while directing particular attention toward larger, socially-grouped needs and prevention efforts to reduce disparity and variation in care. According to Higginbotham, the 30-credit hour program can be pursued on a full or part-time basis, and applications will be accepted on a continuous basis. For more information regarding the degree program, applications and guidelines, visit cchs.ua.edu.